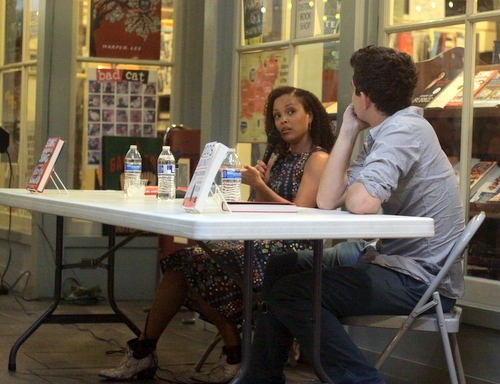 It’s been a busy fall for Tulane University professor Jesmyn Ward. Her new novel, “Sing, Unburied, Sing,” was published just last month, and named a finalist for the National Book Award just last week. On Wednesday, she was announced as one of the latest recipients of the prestigious national MacArthur “genius” grant, and on Thursday, she got to discuss it all with nearly 100 of her fans in Uptown New Orleans at the Garden District Book Shop. Interviewed by New York Times Magazine writer Nathaniel Rich with an overflow crowd crowded onto benches, folding chairs, and leaning against shop walls and stairway banisters in the airy Prytania Street building, Ward spent much of her talk discussing the craft of her writing. 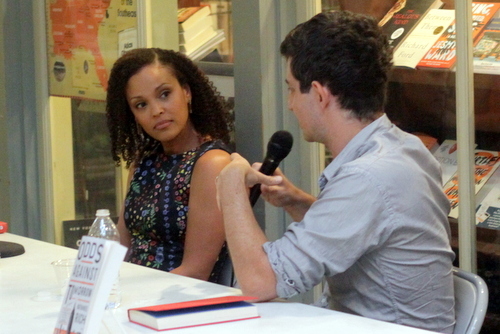 She had a general idea of the book’s main characters — a wayward mother and her mixed-race son — as well as their journey to north Mississippi’s notorious “Parchman” state penitentiary to see the boy’s father. What she didn’t expect, she said, was the development of the supernatural elements in the “Sing, Unburied, Sing,” the voices of Parchman’s past that became embodied in the novel as she learned the plantation-turned-prison’s dark history during the writing process. But when she is writing, she says, the characters take on such a vivid life of their own that not only does she feel as though she hears them speaking to her, she almost feels like she is channeling them as she writes. After reading several short passages from the novel, Ward fielded questions about her writing from the readers who attended her discussion as well. Since becoming a mother, Ward says, she has shifted her writing time from late in the day to early in the morning, making it a part of her routine before she attends to the rest of her day. Ward does not allow herself to read other contemporary fiction while she is writing, not to think much about the potential audience, in order to not to distract her focus on the material she is crafting her first draft, she said. She does, however, think of her readers during the editing process, primarily to ensure clarity. Ward’s work has been compared to that of one of her forbears in Mississippi literature, William Faulkner, and she said the comparisons create a lot of “pressure” for her because of the stature of her work. “As I Lay Dying,” among Faulkner’s most well-known novels, bears some direct structural similarities to “Sing, Unburied, Sing,” she said, because of its use of alternating chapters told from varying first-person perspectives and emphasis on a family’s cross-state road trip. The emphasis on historical race relations in her work derives partly from the stories about growing up in the South that older relatives told her when she was young, she said. Over the years, however, her own research into the history of the South — and particularly the life-and-death struggles that were never given proper due in history books — have drawn more of her attention. With that in mind, Ward said, her next novel will be set in New Orleans well before the Civil War, exploring the city’s history as one of the chief ports of the Atlantic slave trade. Today, she said, the pens where decades’ worth of slaves were kept are memorialized only by two small plaques, one of which is apparently in the wrong place. 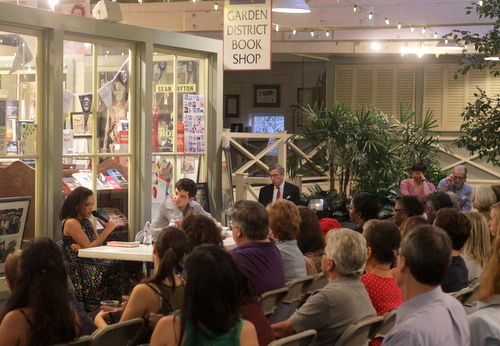 See above for full video of Ward’s conversation with readers at Garden District Book Shop.